Sojourner Truth, who was born a slave, overcame enormous obstacles to become a nationally known speaker and activist for equal rights and justice. To commemorate this remarkable woman, who spent her first 32 years in Ulster County, in 2009 the Town of Esopus Board established the Sojourner Truth Memorial at the corner of Route 9W and Salem Street in Port Ewen. The centerpiece of the memorial is a statue of Truth. 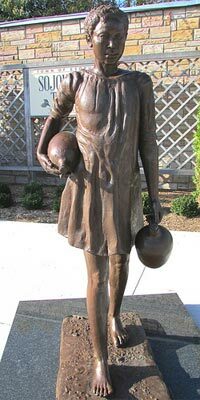 It depicts her as a young girl, when she lived in what became the village of Port Ewen as the slave of Martinus Schryver, a Revolutionary War veteran who owned a tavern in town. While Truth is always portrayed as a towering, simply clad, elderly figure, this statue shows her as a child, living in slavery, going about her daily work. Besides honoring the memory of a woman who devoted her life to the abolitionist cause in particular, and the cause of human rights in general, the memorial also serves to raise public awareness of the fact of the institution of slavery in New York State, and is a reminder that child slavery continues to exist today worldwide. The statue is the work of sculptor, Trina Greene, of New Paltz NY. Ms Greene did a wonderful job in creating the face and figure of a young, leggy girl, living a difficult, lonely life, but filled with determination and hope for the future. The Sojourner Truth Memorial in Esopus was made possible by donations of individuals, businesses, charitable foundations, and a grant from the New York State Assembly obtained by Assemblyman Kevin Cahill. The memorial greenspace was created on the site of the former Esopus Town Hall. Construction was made possible through the New York State Department of Transportation. A commanding presence—she stood six feet tall, had a deep, resonating voice, and was renowned for her wit–Truth met with three presidents in the White House. She was friends with many of the leading reformers of her day. She traveled from Maine to Kansas speaking at abolitionists’ and suffrages’ conferences, was an early “freedom rider” in the Washington, D.C. horse trolleys, and advocated on behalf of freed slaves during and after the Civil War. She also knew many of the key religious figures of her time and lived in utopian communities in Westchester County, Northhampton, Massachusetts, and Battle Creek, Michigan (where her doctor was none other than Dr. J.H. Kellogg, of corn flakes fame). She was a powerful singer of gospel music and supported herself by selling her songs, photograph and memoir; the Narrative of Sojourner Truth was first written down by Olive Gilbert in 1850 and subsequently went through several editions. Truth died at age 86 in Battle Creek in 1883, active until the end. Originally named Isabella, Truth was born a slave in 1797 in the Town of Esopus, a rural community along the western shores of the Hudson River. She was a slave until 1826, after which she lived in the area working as a domestic. During 1828 she was involved in a landmark lawsuit, in which she sued for the return of her young son, who had been illegally sold to an out-of-state slaveholder, and won. It was an extraordinary victory for a poor, illiterate black woman just out of slavery and perhaps the first legal case in America in which an African American woman successfully sued a white man. 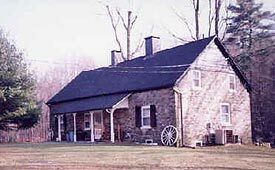 This house, located on Swartekill Creek in Rifton, was the birthplace of Truth in 1797. It was owned by Col. Johannes Hardenbergh. In 1827, New York State emancipated its slaves, and two years later, Truth left for New York City, never to return. But her years in Ulster County resonated throughout her life. Truth’s early experiences as a slave in the area informed her speeches, infusing them with painful emotion and moral authority; she was, in effect, a living witness to slavery’s evils and hence a powerful agent in raising the conscience of her mostly white audiences. Truth’s ability to connect with prominent people sympathetic to her cause also was rooted here. She relied on local Quakers, along with sympathetic lawyers in the area, to help her with her case. In addition, Truth’s deep religious faith was forged while she was in the area. She joined the Methodist Church in Kingston after her conversion, in which she felt called upon to be an instrument of God’s will for good–“to perfect myself and the world,” as she put it, an ideal that became the motivating force of her life. Truth, named Isabella by her parents James and Elizabeth, had a dozen siblings, all of whom, with the exception of her youngest brother, had been sold off at a young age. 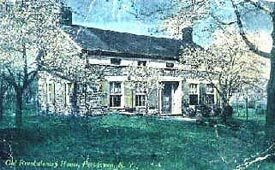 The family was the property of Johannes Hardenbergh, a Revolutionary War colonel and wealthy landowner whose stone house in Swartekill (present-day Rifton) still stands. The Hardenbergh family and their seven slaves all spoke Dutch, reflecting the culture of the first European settlers in the area. Isabella was still a toddler when Hardenbergh died and her family was inherited by his son, Charles. They lived in the cellar of his house, which also served as a hotel—in later years it was known as the Black Swan and was a popular nightspot before being torn down in the 1970s—sleeping on straw laid down on the damp floorboards and getting light from a burning pine knot. When Charles died in 1806, Isabella was auctioned off for $100 with a herd of sheep to John Neely, who owned a store on the Rondout Creek, about a mile and a half from the village of Kingston. Schryver’s tavern, in a c. 1900 photo, where Truth lived as a slave when she was 11 and 12 years old. The building, located at the corner of Route 9W and River Road in Port Ewen, still stands. Schryver bought her and she moved to his tavern in what is now Port Ewen, not far from the Hudson River. The Schryvers were crude—she learned to swear from them—but relatively kind. She took the ferry across the Rondout Creek to the bustling town of Rondout to buy supplies, carried fish in a basket from the river, and performed other errands. One evening, Isabella overheard the singing of a popular song called “Washington’s Ball” at a dance held at the tavern. She remembered the song and could sing it, based on this one event, the rest of her life. The Narrative also alludes to an attachment she formed with a slave named Robert, who lived on a neighboring farm. One day, his owner, an Englishman named Charles Catton, caught Robert visiting Isabella and, assisted by his son, brutally beat him in the yard of Dumont’s farm house. Dumont interfered, following the Cattons, who were dragging the bleeding slave by a rope, back to their farm to ensure they wouldn’t continue to beat him. However, Robert never visited Isabella again, “marrying” another slave owned by Catton as his master intended and dying at a young age. Meanwhile, Dumont “married” Isabella off to Tom, an older slave on his farm. (There was no legal form of marriage between slaves in New York State at this time. Slaveholders, however, could force two slaves into a civil union and also to “divorce,” by later selling one of them off.) She had five children, of whom the father of the eldest, her daughter Diana, was possibly Robert, as indicated by remarks Truth made later in her life as well as comments made by Diana. New York State had begun to legislate the abolition of slavery back in 1799, and in 1826 the state announced the emancipation of all the remaining slaves on July 4 of the next year. (However, children and young adults were still the bound servants of their owners until age 27—in effect, still slaves.) Dumont had agreed to set Isabella free a year early. However, when the date approached, he changed his mind, claiming that a hand injury had made her less productive. Isabella spun 100 pounds of wool for Dumont, which she considered a fulfillment of her obligation to him, then escaped one night in the fall of 1826 by walking with her infant daughter Sophie seven or so miles to the house of a Quaker. Eventually, she ended up in the home of abolitionists Isaac and Maria Van Wagenen. When Dumont tried to take her back, the Van Wagenens paid him $20, plus $5 for the baby, so that she could stay with them. The home of Isaac Van Wagenen, located in St. Remy, where Truth went to live in 1826 when she was escaping slavery. A few months after New York’s emancipation of the slaves on July 4, 1827—a day in which many Ulster County blacks celebrated on the streets of Kingston—Isabella found out that her five-year-old son, Peter, had been sold off by Solomon Gedney, who had bought him from the Dumonts, to a slaveholder in Alabama. This was illegal, since New York law prohibited the selling of slaves (or their children) out of state. To help get him back, Isabella visited a Quaker family based in the nearby hamlet of Poppletown, who put her up for the night. The next day they had her driven to the Ulster County Court House in Kingston, where she took her case to the grand jury. To follow up on the case she would walk barefoot walk five miles each way between the Van Wagenens and the courthouse. In the summer of 1828, she moved to Kingston, living and working as a domestic in the house of lawyer A. Bruyn Hasbrouck. Hasbrouck, a former member of Congress, and his partner Charles Ruggles, along with two other lawyers, worked on her case, probably pro bono. Gedney had brought Peter back from Alabama but refused to produce him in court, as he was required by law. Finally, Isabella hired lawyer Herman Romeyn for $5 to bring Gedney and Peter to court, walking 10 miles to Poppletown to raise the funds from her Quaker friends. After her conversion, she joined the Methodist church in Kingston, which was open to blacks. Convinced she was an instrument of God, Isabella later said her conversion motivated her toward perfecting herself and the world, regardless of her race, class, gender, lack of education (she was illiterate her entire life)—or, she might have added, age: she was in her 50s when she made her first speech as a reformer and continued her activism well into her 80s. 1986 — U.S. Postal Service issues a commemorative postage stamp. 1981 — Truth is inducted into the National Women’s Hall of Fame.